Sarah has driven the broom wagon since 2007. It's a long time to be picking up racers who stop racing. 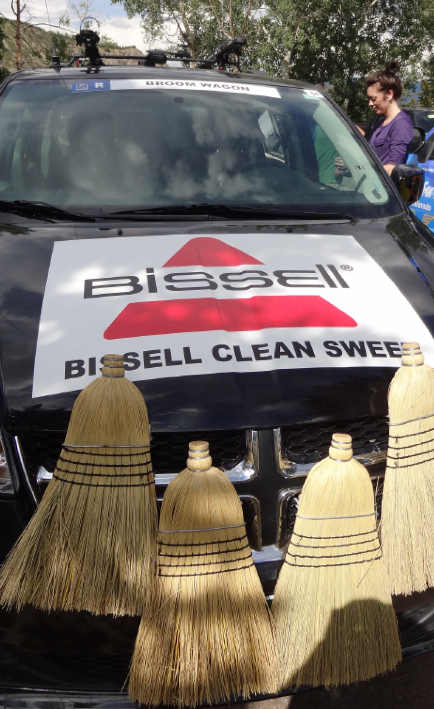 To the fan, the broom wagon signifies the passage of the peloton, the time to wind down the fun. The real purpose of the broom wagon is to sweep the course of riders left behind. The tired, poor, huddled masses - ok the quitters. For those with the stomach bugs, accumulated injuries that disallow the body to fight, cells depleted of energy, or hearts defeated - there is a place of sanctuary in the midst of a bike race. 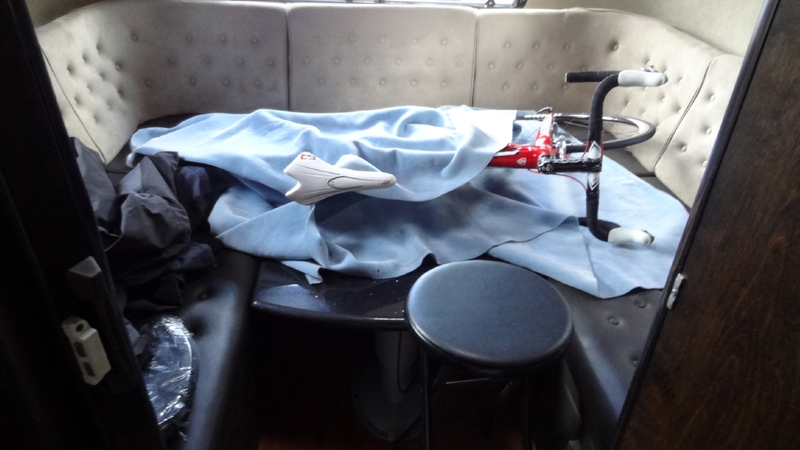 A quiet ride in the back of a car where a rider can question their life as a bike racer and yet somewhere along the miles find comfort and their reason for racing. The driver who carries those war-torn riders needs to be a special soul. Her name is Sarah, and she is part nurse, part technical support, part friend. And a darn good driver who drives miles through throngs of fans, over mountain passes and into city blocks. 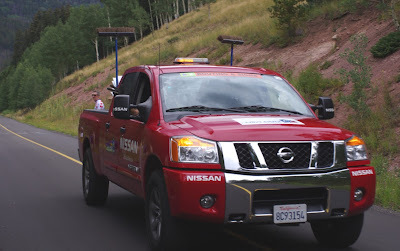 Sarah alone navigates the broom wagon at the Amgen Tour of California and the USA Pro Challenge. "What do you keep in here?" I asked of Sarah as I peered in the back seat of her shinny black Dodge Caravan. "Oh they know I have cookies," she shared with me. "Cookies, aren't you giving them an incentive to get inside the car?" I replied. She smiled back at my comment and added that she also has twizlers, drinks and sometimes even sandwiches. "Do you know when they want to talk and when it is best to be quiet?" "OH yes," Sarah responded, understanding that being in the broom wagon is not the intention or hope of any bike racer at the start of a stage. 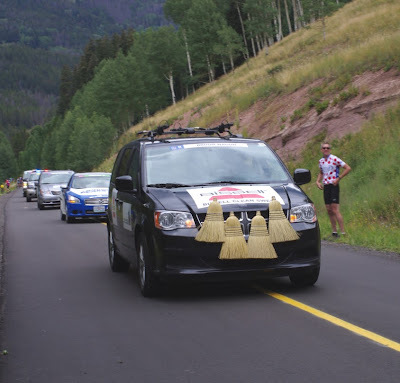 The broom wagon is a long tradition in the competitive sport of multi-day stage races. First placed on course to support riders in the 1910 Tour de France after riders complained that the course was too difficult and wanted assurance they would not be left out in the high cold mountains of the French Pyrenees. The broom wagon is now included in the long line of support vehicles at UCI races as a requirement. This vehicle gets used. Count them - 5 bike racks and 5 seats inside, plus Sarah the kind-hearted driver. In modern times the broom wagon means a rider is finished. Number ripped from their jersey, tears flowing in defeat and humility (over-dramatization, but not always), the riders are seen stepping into the broom wagon never to be seen again. The next time they appear, it is with a line through their name on the team roster, a big DNF (did not finish) marking their history. The car that no rider wants to see the inside of, but inside lie the riches of cookies and sandwiches and a smiling Sarah. Sarah serves a purpose: 1) she is incredibly chipper and friendly, 2) she has a big bike rack on top of the car and plenty of seats inside her car, 3) she transports the riders to the feed station or to the next available team car at the end of the race where she sends them packing, probably with a twizler to go, 4) she takes good care of the brooms. Ok, no - this is a joke, this was actually the back seat of the Nissan KOM RV that was at the race handing out free tshirts to all of us. Sarah's prority is rider safety, the bikes go on top of the car. Yes, Sarah recycles her brooms, using the same brooms race after race. They are neatly labeled with the broom wagon car label and placed in a container for safe keeping. Stored with all the other race equipment, they wait to be rehung with great pride at the start of the next race. Although that last stage in Denver sort of did them in, hopefully they can be cleaned up, vacuumed off with a Bissell and rehung next year. Sarah is part of the hard-working race crew and caravan that make the races on U.S. soil happen. A team who have known each other for years; many started in the Tour of Georgia days. That is when Sarah joined on as a volunteer for a day (which became a week, then became years) when she was living in Georgia at the time. I'd say that gig changed her life. She even met her fiance at the race (another staff member), years later he proposed to her - at the race, in front of all the other staff members. Sarah and her soon-to-be-hubby now live in Greenville, South Carolina, a few states away from California and Colorado, but this is what they do for fun, year after year. You can bet we will see Sarah again next year at the race - be sure to give her a wave. The car make, model and color change at every race, but the brooms are a constant, so is Sarah. 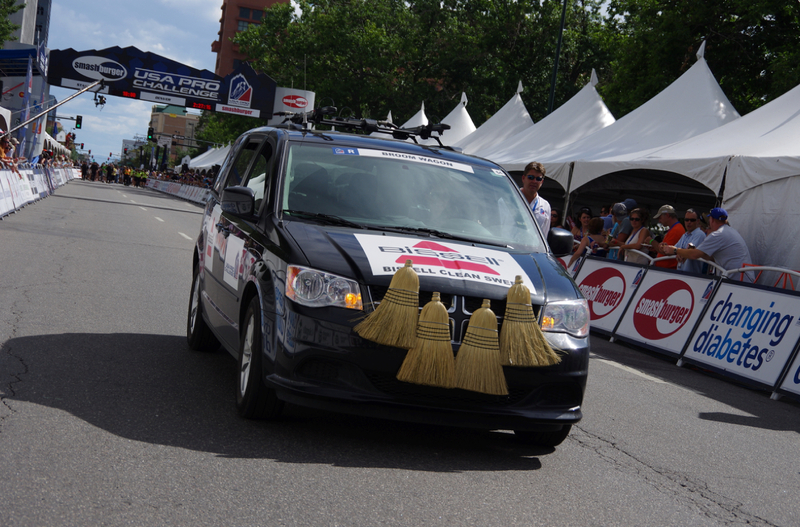 The last passage of the broom wagon on Stage 7 into Denver after 599 miles of racing and many more miles of transfers. Read more of the history: Word of the day at the TDF: voiture balai. The broom wagon at the Tour de France does not always have visible brooms attached. We can thank Sarah for carrying on the tradition of the brooms for those of us here in the United States. They sure make the car easily recognizable to fans. Sarah drives the official broom wagon, as opposed to the sweeper/sign picker-upper truck. Its purpose is to clean the course and collect all signage. If Sarah's car is full, they have a second backup vehicle on route able to carry riders safely home. The official 'Routing and Signs' Truck, which carries brooms but is a cheap imitation of the real broom wagon. UCI rule 2.2.030 A rider dropping out of the race must immediately remove his body number and hand it to a commissaire or to the broom wagon. He may not cross the finish line. Unless he is injured or feels seiously sick, he must travel in the broom wagon. 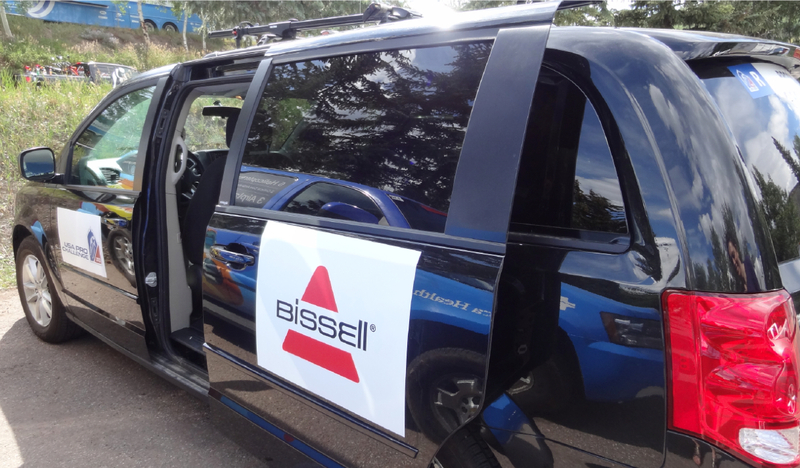 Technical support for every mixed team will be provide by a neutral vehicle. The organizer must ensure that there are at least 3 other adequately equipped neutral support vehicles (cars or motorcycles) and a broom wagon. 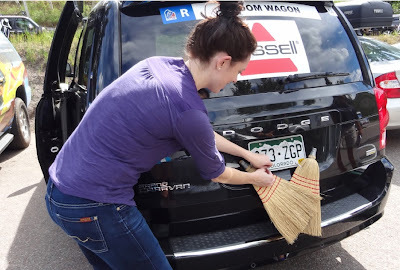 Riders may only receive technical support from the technical personnel of their team or from one of the neutral support cars or else from the broom wagon. 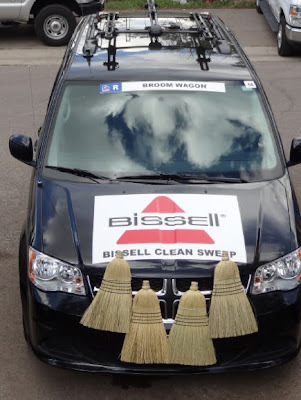 ... time keeper commissaires shall continue to officiate until the broom wagon appears.